In addition to ecological impacts, Riswan added several social risks and disasters that would arise due to the construction of hydropower. “According to the Environmental Impact Analysis (ANDAL) document issued by PT. KAMIRZU, the area of the inundation is estimated at 4,090 hectares and to meet the inundation as large as the area takes up to one year, it is certain that 50% of the villages located downstream of the Tamiang Watershed will experience severe drought during that period, “Riswan said . The location of Tampur hydropower located east of the Great Sumatran Fault makes the location of this dam at one of the centers of the Sumatra mainland earthquake. The 193 meter high dam has the potential to break down and engulf many lives to bring disaster to the people who are downstream. “It has been noted historically that there have been several large earthquakes, around 6.0 SR around the dam site, the higher the dam withstand large amounts of water pressure, the riskier it is to break down and flood downstream communities, we certainly do not want the dam to collapse such as in Laos last July 2018 to also happened in Indonesia, “said Riswan. Not only damaging and potentially catastrophic, the Tampur hydropower development plan also reaps with problems regarding the permit process. M. Fahmi, the HAkA Foundation Legal Team revealed that, “Borrow-Use Of Forest Areas Permit (IPPKH) used by PT. KAMIRZU is deemed not in accordance with the provisions of the prevailing laws and regulations, because based on the Ministry of Environment and Forestry Regulation of the Republic of Indonesia on Guidelines on Borrow-Use of Forest Areas, IPPKH can only be issued by the Minister based on the request, although within that law the Minister can give authorisation to the Governor a representative of the central government in the region, but only for the construction of public facilities that are non-commercial with a maximum area of 5 (five) hectares, while this project has been ascertained using more than five hectares of forest area and is not included in the category of non-commercial public facilities such as mentioned in the Regulation of the Director General of Forestry Planning”. Within the period that has been granted for 1 (one) year from the Governor’s Decree is issued, PT. KAMIRZU has also not been able to show the specified supporting documents, so that the IPPKH becomes null and declared invalid. “Therefore, the IPPKH should be revoked and the permit holder is subject to sanctions in accordance with laws and regulations, if the permit holder does not fulfill the obligations and / or violates the provisions referred to in this permit. 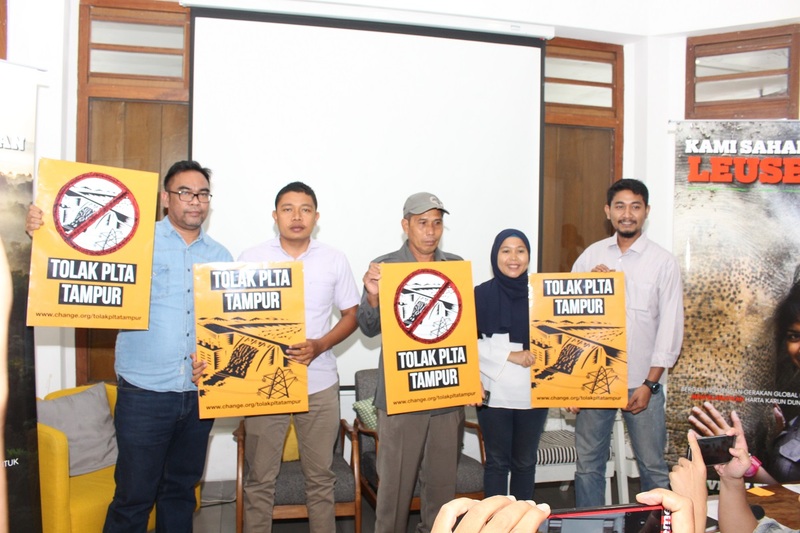 We also request that the central government, in this case the Ministry of Environment and Forestry to not issue IPPKH regarding with the construction of the Tampur Hydroelectric Power Plant”, explained Fahmi who also stressed that his party together with the Environmental Defenders Association (P2LH) would take this case to court if in the period when IPPKH was not valid, logging activities or transporting heavy equipment in the Tampur hydropower project area continues. Meanwhile, the people living in the downstream of the Tamiang river begins to feel anxious about the plan to construct the Tampur hydropower. “We feel anxious because we were traumatized by the flash floods that hit Aceh Tamiang in 2006. 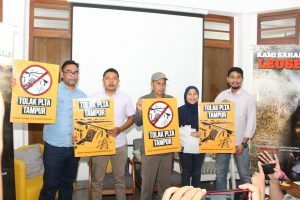 It’s not that we are anti-development, but there are still many other places that can generate electricity without destroying the forests and causing disasters,” said Matsum, an Aceh Tamiang resident who started the petition “Cancel the Tampur Hydropower Project that Threatens Millions of Life” on the Change.org page. The petition can be seen at the change.org/TolakPLTATampur link and has gotten more than 5000 support and continues to grow.